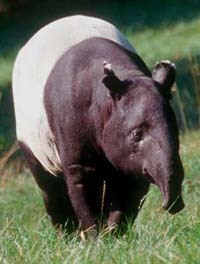 Tapirus indicus, the Asian or Malayan tapir, is the largest of the four living species of tapirs, weighing around 350 to 400 kg (800 to 900 lbs). Its coloration is unusual, with a broad white ‘saddle’ on an otherwise black coat. This pattern creates a disruptive camouflage that helps break up the tapir's outline, making it more difficult to see in the forested areas in which it lives. The Asian tapir is a remnant of a much more diverse assemblage of tapirs that once ranged across much of Europe and Asia. This group included the giant Tapirus augustus from the Pliocene of southern China, a close relative of Tapirus indicus that was the size of a small rhinoceros. Unfortunately, the future survival of the Asian tapir is questionable – largely because of loss of habitat resulting from human population growth. It is listed as ‘endangered’ by the IUCN Red List of Threatened Species. 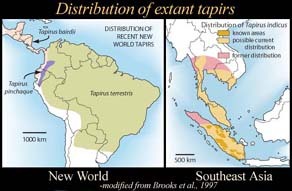 The Asian tapir lives in the forests and jungles of Southeast Asia, and is the only living tapir species inhabiting the Old World (see map). The other three species live in Central and South America, and are more closely related to one another than they are to the Asian tapir. Based on fossil evidence, it appears that the lineages leading to the New World tapirs and the lineage leading to the Asian tapir may have split from one another in the early Miocene. Molecular clock evidence places the divergence at about 18 to 23 million years ago (Norman and Ashley, 2000). The skull of the Asian tapir is larger than those of the other living species, and shows modifications associated with this large size. In particular the frontal sinuses are extremely large. These air-filled cavities help maintain the skull’s external shape, while reducing its weight. The frontal sinuses of the Asian tapir are notably larger than those of the New World tapirs, as illustrated by the CT slices shown at the left. Animated visualizations of the frontal sinus cavity and cranial cavity of the Asian tapir can be found on the ‘additional imagery’ page. No data is associated with this specimen. It was most likely acquired from a zoo. The specimen was borrowed for scanning from the Department of Mammalogy at the American Museum of Natural History. The skull was scanned by Richard Ketcham on 15 June 1998 along the coronal axis for a total of 418 slices, each slice is 1.0 mm thick, with a 1.0 mm interslice spacing and field of reconstruction of 295 mm. The animations displayed are reduced from the original imagery for optimal Web delivery. See the inspeCTor for unreduced CT data. Colbert, M. W. 1999. Patterns of Evolution and Variation in the Tapiroidea (Mammalia: Perissodactyla). Unpublished Ph.D. Dissertation, The University of Texas at Austin, 464 pp. Colbert, M. W., and R. M. Schoch. 1998. Tapiroidea and other moropomorphs: in Evolution of Tertiary Mammals of North America. C. M. Janis, K. M. Scott, & L. L. Jacobs (eds. ), Cambridge University Press, p. 569-582. Hatcher, J. B. 1896. Recent and fossil tapirs. American Journal of Science 1:161-180. Holbrook, L. T. 1999. The phylogeny and classification of tapiromorph perissodactyls (Mammalia). Cladistics 15:331-250. Holbrook, L. T. 2001. Comparative osteology of early Tertiary tapiromorphs (Mammalia, Perissodactyla). Zoological Journal of the Linnean Society 132:1-54. Norman, J. E., and M. V. Ashley. 2000. Phylogenetics of Perissodactyla and tests of the molecular clock. Journal of Molecular Evolution 50:11-21. Parker, W. N. 1882. On some points in the anatomy of the Indian tapir (Tapirus indicus). Proceedings of the Zoological Society 1882:768-777. Paulli, S. 1900. Über die Pneumaticität des Schädels bei den Säugethieren. II. Über die morphologie des Siebbens und die der Pneumaticität bei den Ungulaten und Probosciden. Morphologisches Jahrbuch 28:179-251. Radinsky, L. B. 1963. Origin and early evolution of North American Tapiroidea. Bulletin of the Peabody Museum of Natural History 17:1-115. Radinsky, L. B. 1965. Evolution of the tapiroid skeleton from Heptodon to Tapirus. Bulletin of the Museum of Comparative Zoology 134:69-103. Radinsky, L. B. 1965. Early Tertiary Tapiroidea of Asia. Bulletin of the American Museum of Natural History 129:183-263. Reshetov, V. Y. 1975. Morphology of skull of asiatic Eocene tapiroid (Lophialetes expeditus Matthew et Granger, 1925). Journal of the Palaeontological Society of India 20:41-47. Schoch, R. M. 1989. A review of the tapiroids: in The Evolution of the Perissodactyls. D. R. Prothero and R. M. Schoch (eds. ), Oxford University Press, p. 298-320. Simpson, G. G. 1945. Notes on Pleistocene and Recent tapirs. Bulletin of the American Museum of Natural History 86:36-81. Witmer, L. M., S. D. Sampson, and N. Solounias. 1999. The proboscis of tapirs (Mammalia: Perissodactyla): a case study in novel narial anatomy. Journal of Zoology 249:249-267. Endocast imagery produced by Dr. Matthew Colbert and Ms. Holly Nance. 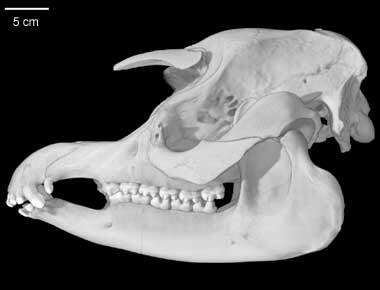 Click on the thumbnail to the left for an animation (1.2 mb) of the cranial endocast of Tapirus indicus. The cranial endocast is the cavity in the skull that houses the brain and its associated blood vessels and membranes. As in most mammals, the cranial endocast conforms fairly closely to the actual shape of the brain. The two bulbous structures at the left (front) end of the endocast are casts of the ethmoidal fossa, which house the olfactory bulbs. They are unusually widely spaced compared to other mammals. Click on the thumbnail to the left for an animation (1.3 mb) of the endocast of the cranial cavity and frontal sinus endocast of Tapirus indicus. The frontal sinus of the Asian tapir is quite large, extending over the dorsal surface of the brain. Click on the thumbnail to the left for an animation (1.2 mb) of the cranial endocast (highlighted in red) within a semi-transparent skull of Tapirus indicus. Note that the brain does not occupy much of the volume of the skull. Nobody has accused tapirs of being mental giants. Click on the thumbnail to the left for an animation (1.2 mb) of the endocast of the cranial cavity and sinuses (highlighted in red) of Tapirus indicus. The air-filled frontal sinus occupies a large volume in the antero-dorsal part of the non-facial portion of the skull, reducing the overall weight of the skull. For more endocast imagery, please visit the gray wolf, feral domestic cat, and bottlenose dolphin pages under their respective "Additional Imagery" tabs. To cite this page: Dr. Matthew Colbert, 2003, "Tapirus indicus" (On-line), Digital Morphology. Accessed April 25, 2019 at http://digimorph.org/specimens/Tapirus_indicus/.